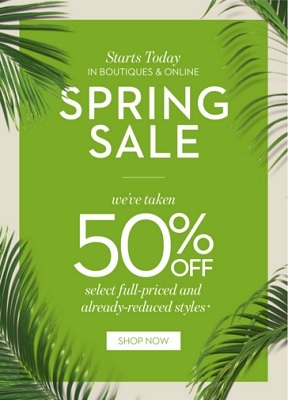 Have you already heard about Spring sale from Chico's? Visit your nearest Chico's store location in the U.S. and receive an additional 50% on selected full-priced and already-reduced styles. You can also enjoy this offer at Chico's online. Source of the information is Chico's. For more details visit your nearest Chico's location or Chico's online. Offer is time limited!